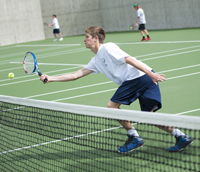 Community School tennis players have been busy with several home and away meets leading up to the state-qualifying Districts 4/5/6 3A tournament Friday, May 9 at Sun Valley Tennis Club. Thursday, the Cutthroats traveled to Twin Falls and battled two 5A teams—perennial 5A power Idaho Falls and Skyline. Idaho Falls went on to win last weekend’s Capital Invitational tourney in Boise. Idaho Falls won all six of the doubles matches and captured a 10-2 dual meet win over Sun Valley. But the Cutthroats earned a 10-2 win over Skyline by capturing all six singles matches and four of the six doubles matches. Coach Phil Huss said the Skyline meet was “the best tennis we have played all season.” It was also interrupted by wet weather. Many matches were decided in pro sets or rained out after the first set. Singles winners for the Cutthroats were Willis Sanchez-duPont 6-0, 6-0; George Everitt 8-1; Henry Everitt 8-3; Olivia Ott 8-6; Hannah Conn 8-0; and Blair Baker 8-0. No. 1 boys’ doubles Roger Figge-Trenor Gould won 6-0, 6-3. Autumn Fluetsch-Grace Cherp 8-1. No. 1 mixed Reed Roudabush-Jolie Blair dropped a 9-8 tiebreaker, while No. 2 mixed Nick Wright-Isabelle Caraluzzi posted a 6-3 win. On a blustery Saturday with 30 mile-per-hour wins, the Cutthroats won five of six doubles matches and defeated host Mountain Home 9-3 including 5.5-0.5 boys and 3.5-2.5 girls. Boys’ singles winners in straight sets were Sanchez-duPont, George Everitt and Henry Everitt. At No. 1 girls’ singles, Olivia Ott won 6-0, 6-0. Sweeping boys’ and girls’ doubles was the Sun Valley team coached by Huss, Christine Dickson and Elliot Jacobs. Boys’ winners were Roger Figge-Trenor Gould and Dan DuFur-Gavin Blair. Girls’ winners were Emily Siegel-Sam Busby and Sophia Deklotz-Grace Cherp. Rounding out the Cutthroat wins were No. 1 mixed doubles Reed Roudabush-Jolie Blair breezing by 6-1, 6-3 scores. The Cutthroats, Gooding and Sugar-Salem of Sugar City will be competing for state tournament berths next Friday at Sun Valley—and that’s where they faced off Monday in a regular-season tri-meet on the resort courts. By winning 11-1 and 11-1, the Cutthroats earned top seeds in four of the five events, all except mixed doubles, before next Friday’s districts. Sanchez-duPont and the Everitt brothers powered through boys’ singles, while Olivia Ott, Hannah Conn and Blair Baker didn’t drop a game in their singles matches. Boys’ doubles winners were Dan DuFur-Doug DuFur and Figge-Gould. Girls’ doubles winners Monday were Siegel-Busby and Autumn Fluetsch-Isabelle Caraluzzi. The No. 2 mixed doubles team of Gavin Blair-Jolie Blair prevailed by 7-5, 6-2 and 6-3, 7-6 scores. No. 1 mixed doubles Reed Roudabush-Jolie Blair had their work cut out for them with a 6-3, 4-6, 7-6 win over Gooding and a 6-3, 7-6 loss to the top-seeded Sugar team. The Cutthroats hosted Wood River and Canyon Ridge of Twin Falls Tuesday and entertain Mountain Home Thursday, May 1 at 3:30 p.m. at Sun Valley Tennis Club. Wood River finished in 27th place with 116 points at the 32-team Capital Invitational April 25-26 in Boise. Idaho Falls captured the team title 320-298 over Timberline of Boise. Canyon Ridge of Twin Falls was 24th with 136 points, Twin Falls 30th with 105 and Jerome 31st with 103 points.